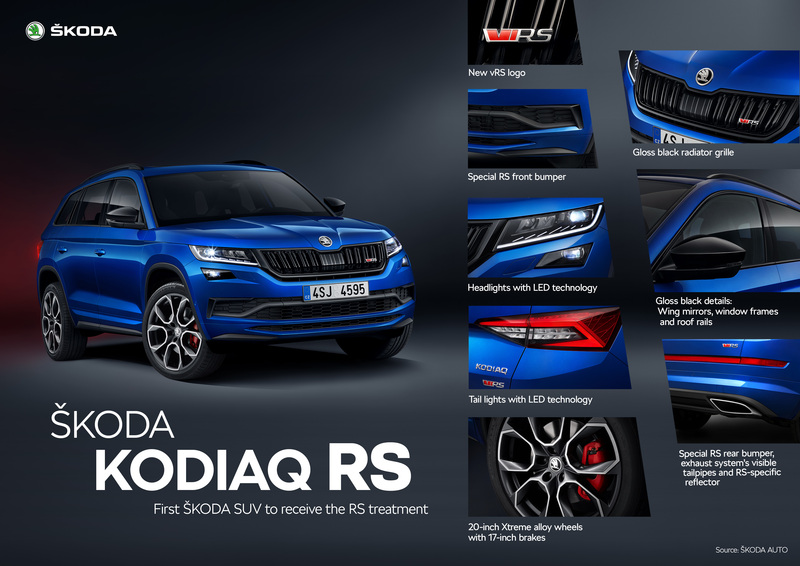 The ŠKODA KODIAQ RS is the first Czech brand’s SUV to bear the RS initials. 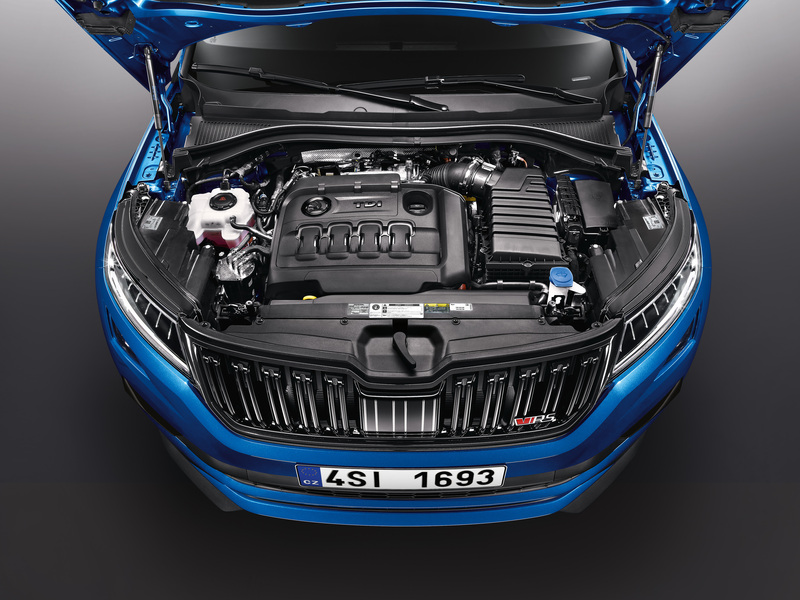 The engine found in the ŠKODA KODIAQ RS produces 176 kW (240 PS), making it the most powerful production diesel in the history of ŠKODA. 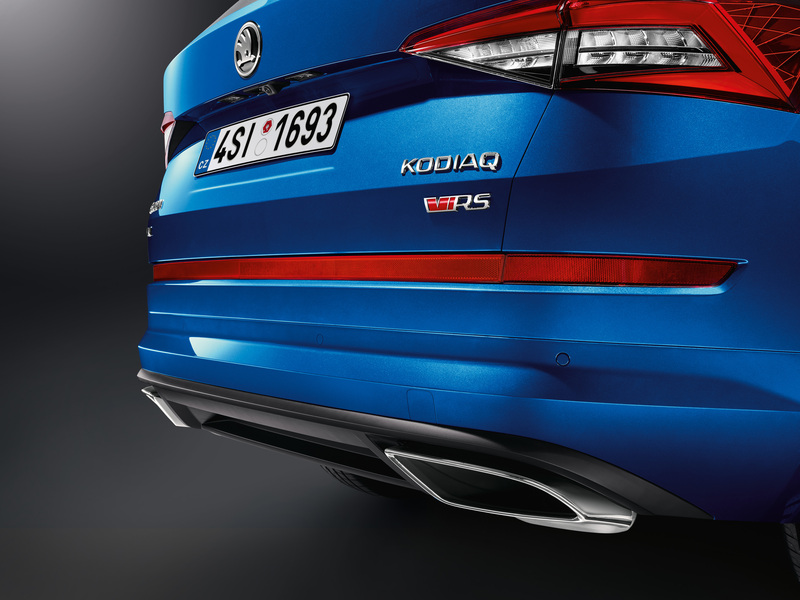 It offers a particularly emotive engine note thanks to Dynamic Sound Boost – which is making its debut in a ŠKODA. 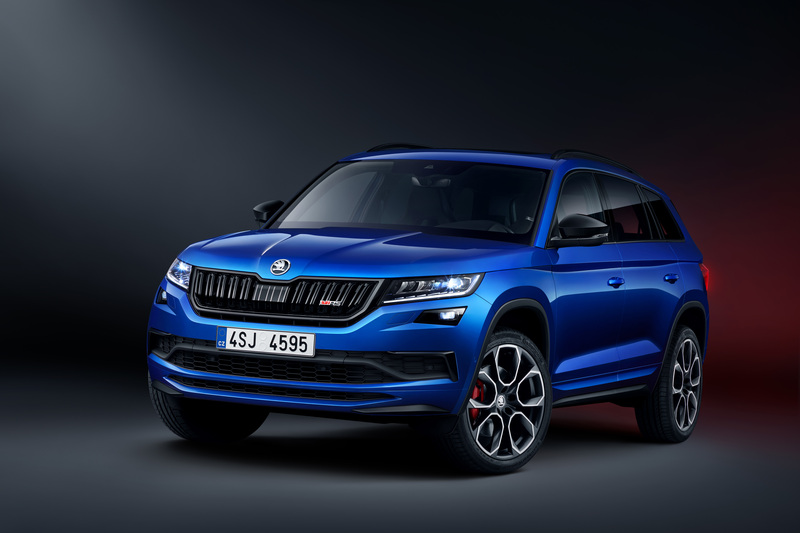 This perfectly complements the power of the ŠKODA KODIAQ RS, which holds the lap record for seven-seater SUVs on the Nürburgring’s Nordschleife with a time of 9 minutes, 29.84 seconds. The initials RS now represent the perfect combination of a sporty driving experience and excellent suitability for daily use. 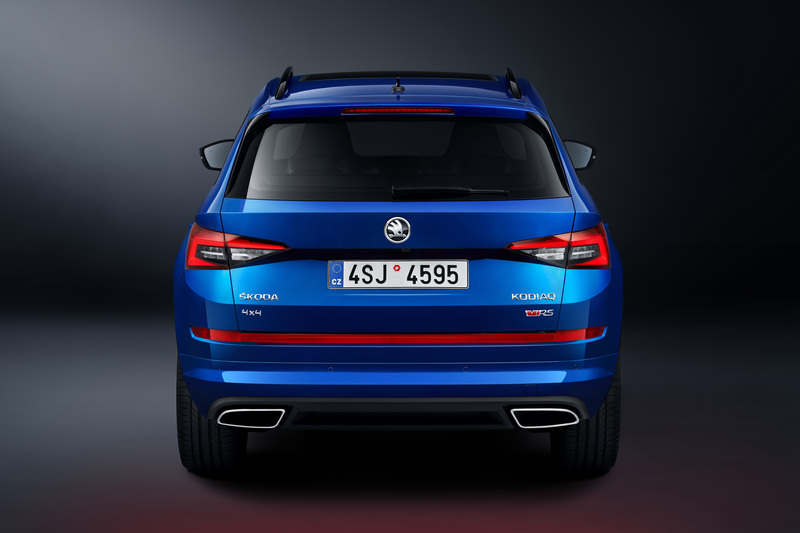 The ŠKODA KODIAQ RS is now the brand´s first ever SUV to bear these initials steeped in tradition. 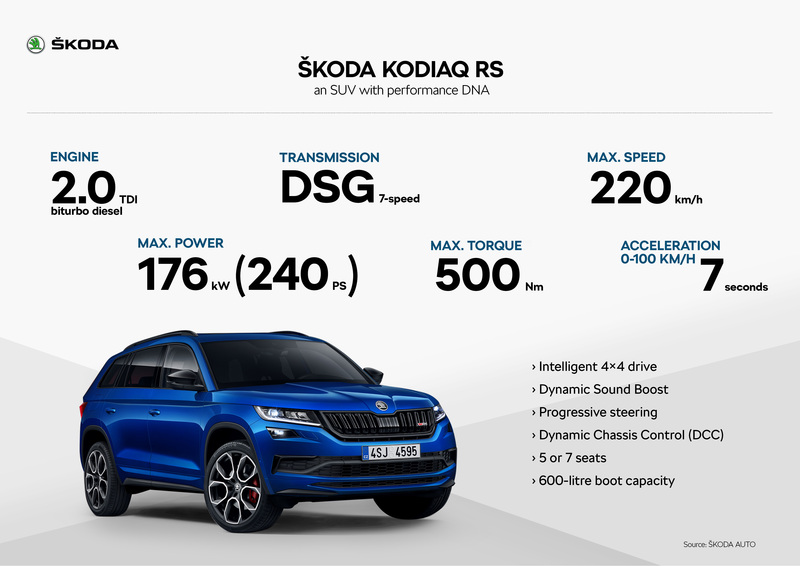 The extraordinarily dynamic capabilities – both on and off the road – and the powerful appearance of the ŠKODA KODIAQ RS complement the sporty lifestyle of a constantly growing target group in the SUV segment excellently. 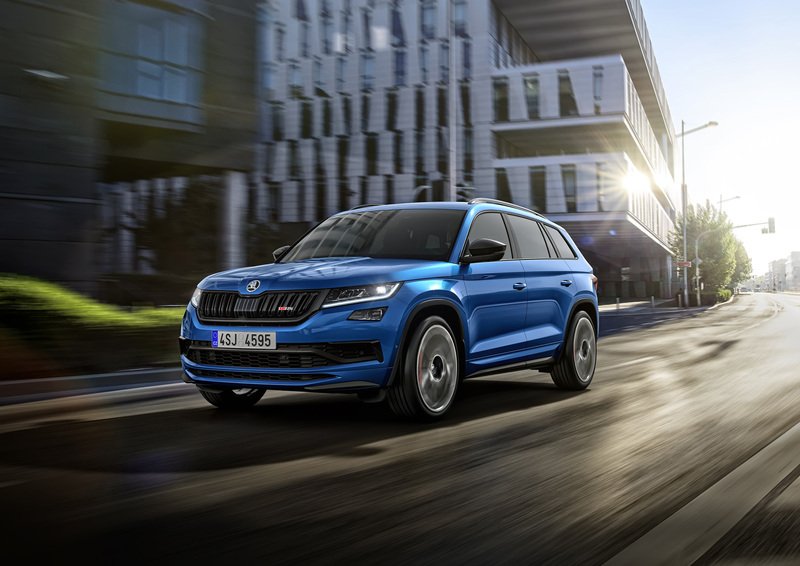 The ŠKODA KODIAQ RS demonstrated its sporty qualities on the Nürburgring’s legendary Nordschleife: the lap time of 9 minutes, 29.84 seconds is a record for a seven-seater SUV. This record proves that the ŠKODA KODIAQ RS doesn’t just look sporty – it drives in a sporty way too. Racing driver Sabine Schmitz was at the wheel during the record-breaking lap. The only woman to have won the 24-hour race at the Nürburgring to date was also impressed by how fast ŠKODA’s seven-seater SUV in standard trim can move on the world’s most challenging race track. Top results and innovations not only come from the engine or Dynamic Sound Boost. 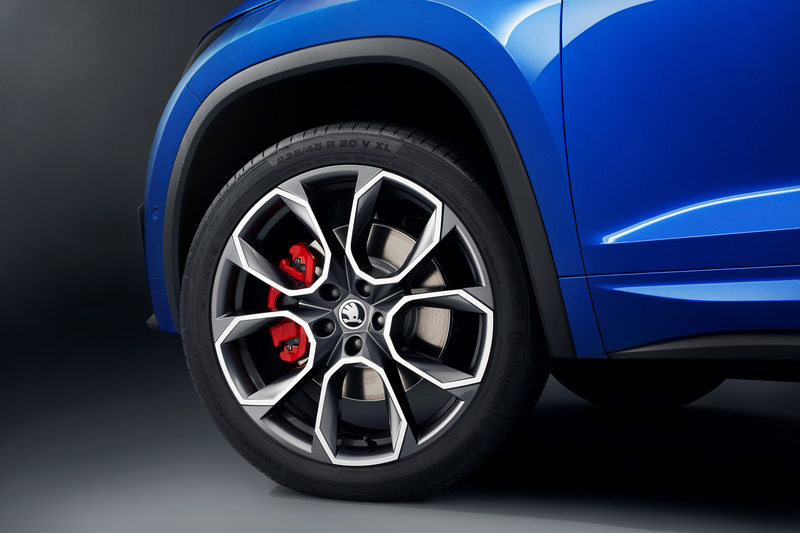 20-inch Xtreme alloy wheels come as standard for the first time in a ŠKODA. Body elements in gloss black emphasise the sporty look; the progressive steering, intelligent all-wheel drive and the 7-speed DSG increase the dynamic potential. The RS oozes sportiness yet remains a true KODIAQ and thus a practical family car with a choice of five or seven seats and a spacious boot. 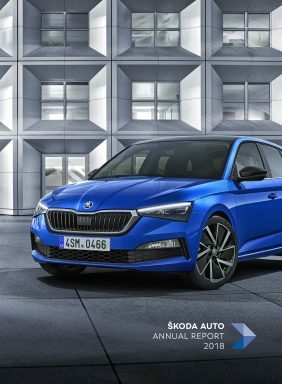 Wi-Fi access and the ŠKODA Connect services offer state-of-the-art connectivity and numerous Simply Clever features make everyday driving easier – in typical ŠKODA style. 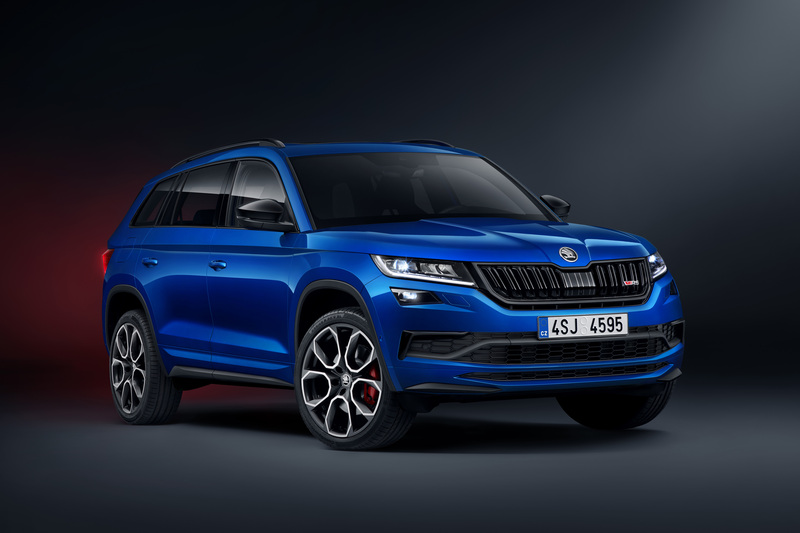 The new ŠKODA KODIAQ RS exclusively comes with a 2.0-litre, four-cylinder biturbo diesel engine producing 176 kW (240 PS) and maximum torque of 500 Nm. In its history spanning more than 120 years, the brand from Mladá Boleslav has never built a more powerful production diesel engine. The ŠKODA KODIAQ RS is the sporty top-of-the-range model and the dynamic driving performance is worthy of this status. 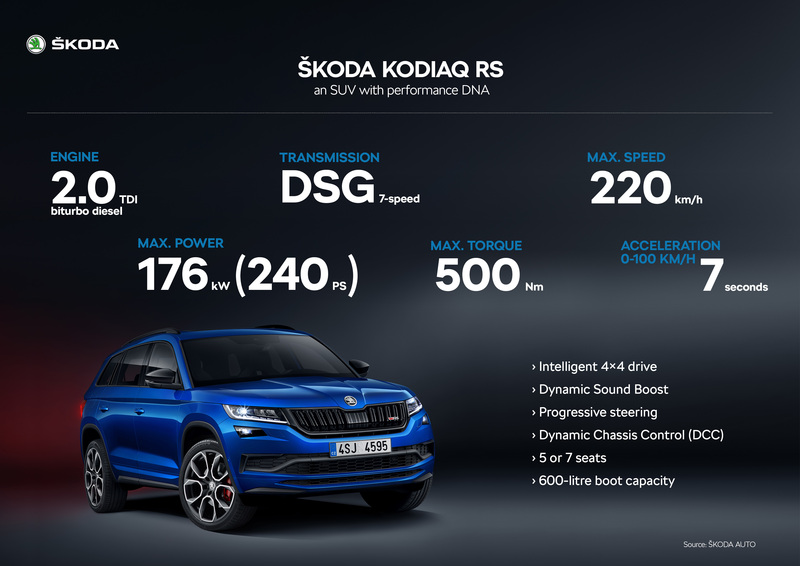 The ŠKODA KODIAQ RS can accelerate from a standing start to 100 km/h in just seven seconds and has a top speed of 220 km/h. The engine’s tractive power at lower engine speeds is also impressive: maximum torque is already available between 1,750 and 2,500 rpm. Fuel consumption of just 6 l of diesel per 100 km* illustrates the engine’s high level of efficiency. CO2 emissions are 157 g/km*. 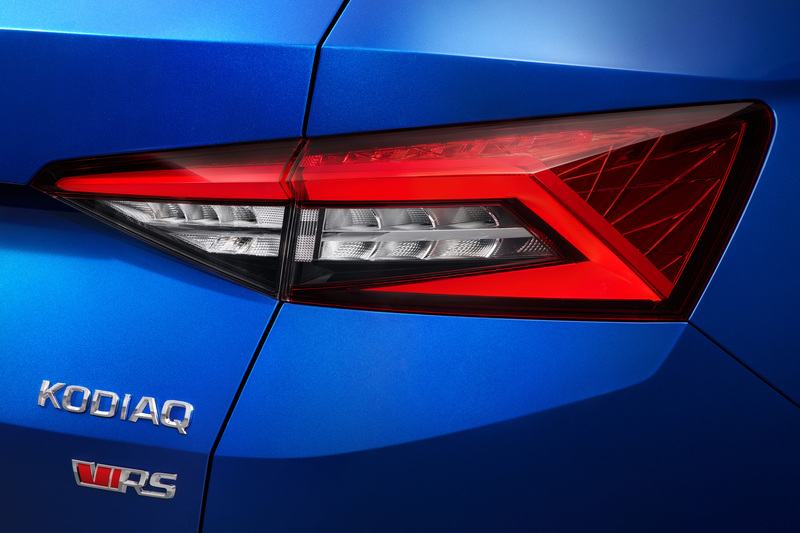 A variety of technical factors make this possible: the biturbo engine in theŠKODA KODIAQ RS features direct injection, a Stop-Start system and brake energy recovery, for example. It also has a sophisticated thermo-management system, which swiftly brings the engine up to operating temperature once the ignition is switched on. 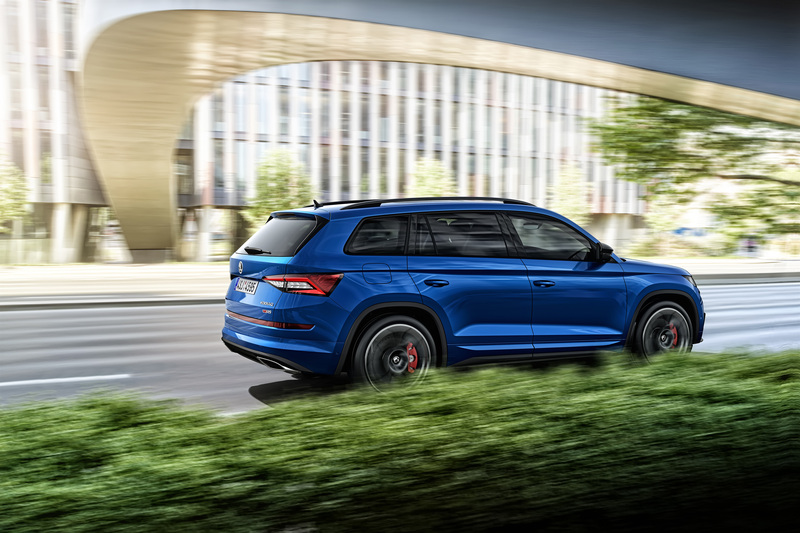 The new ŠKODA KODIAQ RS is the first of the brand’s models to feature Dynamic Sound Boost. The system provides a characteristic and emotive acoustic experience both inside and outside the car. Dynamic Sound Boost works using data from the in-car electronics to make the car’s acoustic character more attractive and intense. The special device produces a specific note, which complements the natural sound of the exhaust system and refines the engine’s sound profile. Dynamic Sound Boost works in conjunction with Driving Mode Select. 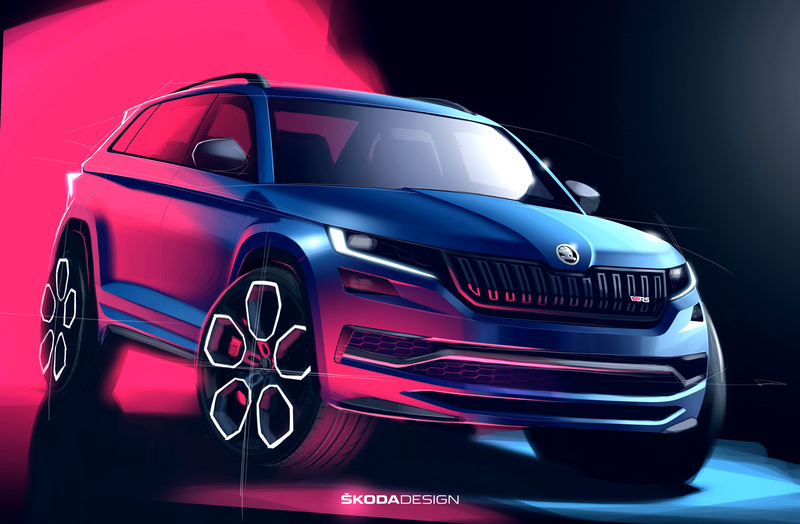 There are three levels of modified sound available for the ŠKODA KODIAQ RS depending on the selected driving performance. The sounds range from a gentle note in the ‘Comfort’ profile to a ‘Normal’ profile featuring a dynamic setup, up to the ‘Sport’ profile, which provides the most sporty and potent setting. 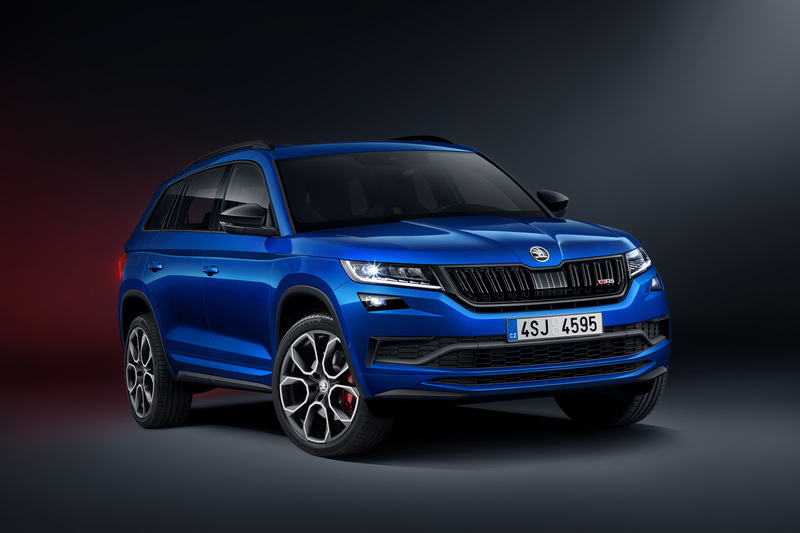 This gives the ŠKODA KODIAQ RS a particularly dynamic note. The ‘Eco’ profile emphasises the car’s natural acoustic character. *The values given are provisional and subject to change. The specified fuel consumption and emission data have been determined according to the measurement procedures prescribed by law. Since 1st September 2017, certain new vehicles are already being type-approved according to the Worldwide Harmonized Light Vehicles Test Procedure (WLTP), a more realistic test procedure for measuring fuel consumption and CO₂ emissions. Starting on September 1st 2018, the New European Driving Cycle (NEDC) will be replaced by the WLTP in stages. Owing to the more realistic test conditions, the fuel consumption and CO₂ emissions measured according to the WLTP will, in many cases, be higher than those measured according to the NEDC. 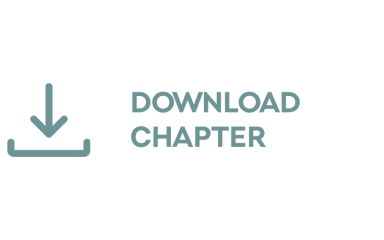 We are currently still required by law to state the NEDC figures. 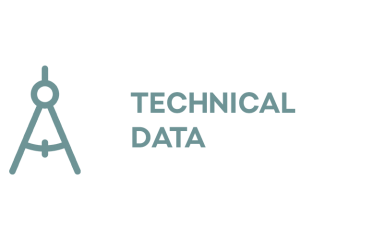 In the case of new vehicles which have been type-approved according to the WLTP, the NEDC figures are derived from the WLTP data. It is possible to specify the WLTP figures voluntarily in addition until such time as this is required by law. In cases where the NEDC figures are specified as value ranges, these do not refer to a particular individual vehicle and do not constitute part of the sales offering. They are intended exclusively as a means of comparison between different vehicle types. 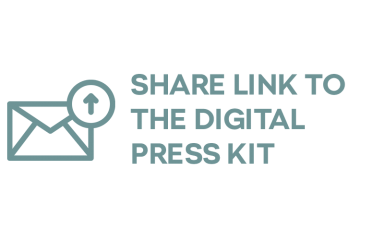 Additional equipment and accessories (e.g. add-on parts, different tyre formats, etc.) may change the relevant vehicle parameters, such as weight, rolling resistance and aerodynamics, and, in conjunction with weather and traffic conditions and individual driving style, may affect fuel consumption, electrical power consumption, CO₂ emissions and the performance figures for the vehicle. 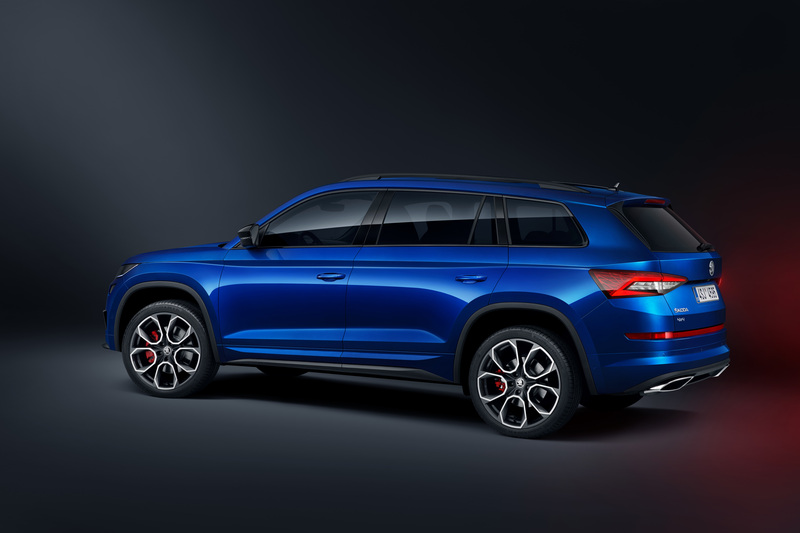 The new ŠKODA KODIAQ RS distributes its 176 kW (240 PS) variably to all four wheels using intelligent all-wheel drive; a 7-speed DSG controls the traction. The settings of shock absorbers can be adjusted to suit the driver’s preferences and the respective terrain at any time using the adaptive Dynamic Chassis Control (DCC), which also comes as standard. 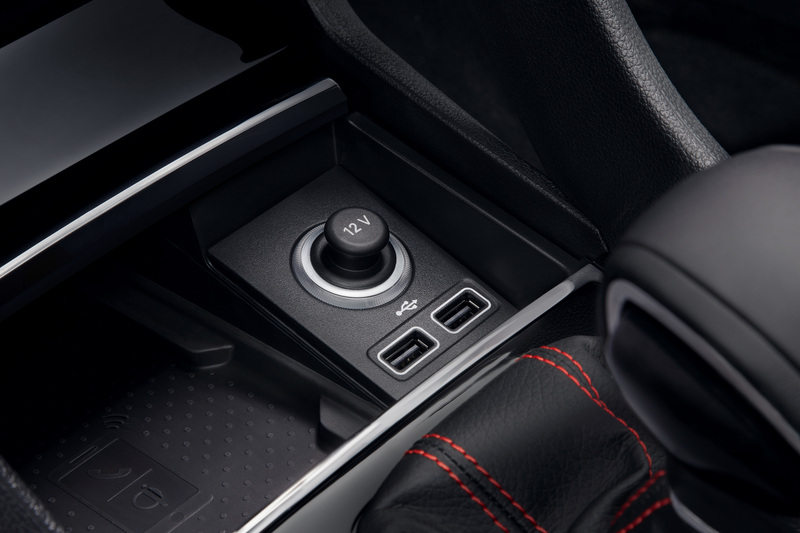 The ŠKODA KODIAQ RS’s 7-speed DSG can change gear automatically or the driver can manually select gears. The transmission impresses with superfast, smooth gear changes that don’t interrupt power delivery and also supports coasting. In the Eco mode, this function automatically uncouples the engine and transmission, for example if the driver takes their foot off the accelerator, and thereby increases the efficiency. The vehicle moves without the braking effect of the engine. The intelligent all‑wheel drive with electronic multi-plate clutch and electronic differential lock constantly calculates the ideal distribution of power. This system can transfer up to 85 per cent of the available torque to one individual wheel or – when driving with a light load – can also power the front wheels only. The all-wheel drive increases the traction and thus improves driving safety – in all weather and road conditions as well as when driving off-road. 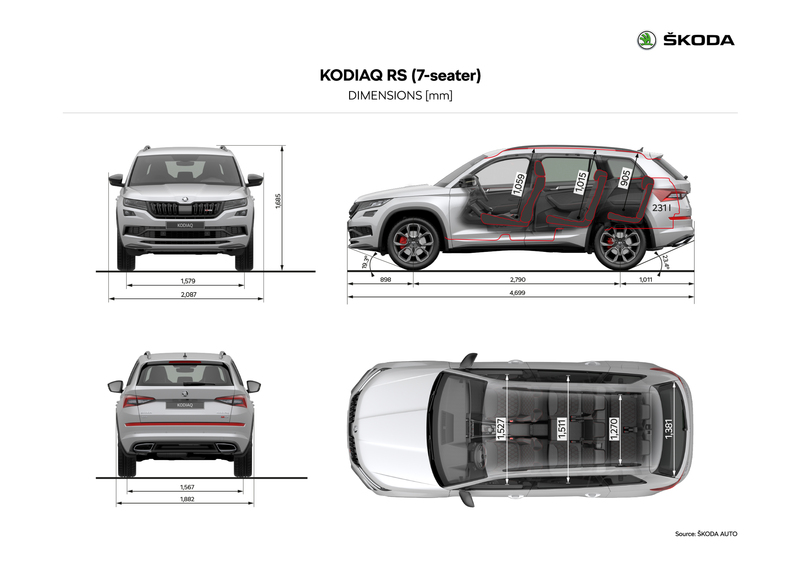 The adaptive Dynamic Chassis Control (DCC) with Driving Mode Select optimally adjusts the springs and shock absorbers of the ŠKODA KODIAQ RS to suit the terrain and driving style. This offers the driver six different programmes – Eco, Comfort, Normal, Sport, Individual and Snow – with corresponding, electronically adjusted shock absorber settings. 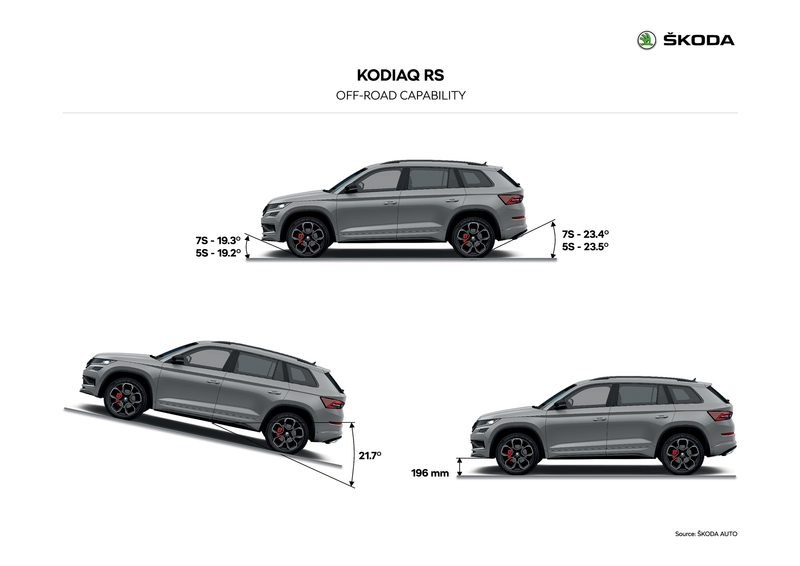 The new ŠKODA KODIAQ RS also comes with progressive steering as standard. This electronically adapts the steering ratio to suit the current speed and guarantees even more control for sportier driving. 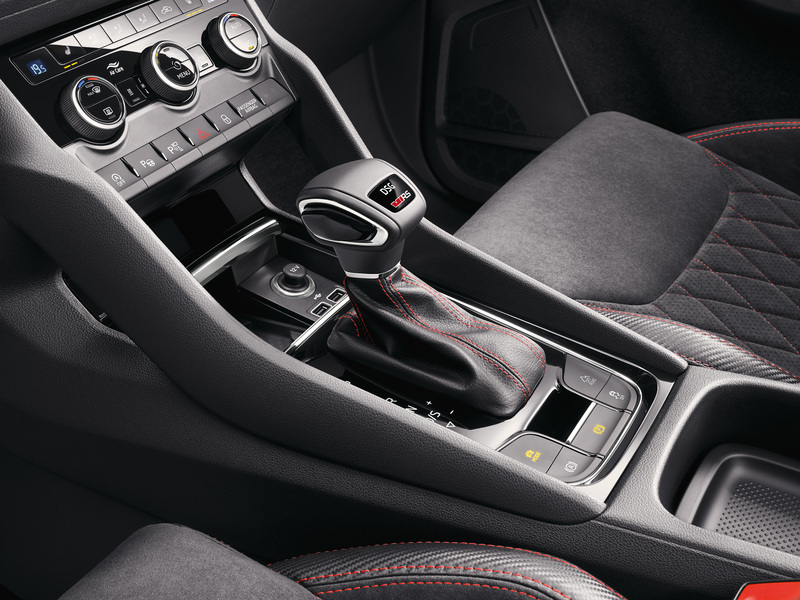 It also guarantees additional comfort thanks to reduced steering forces at low speeds and when parking. 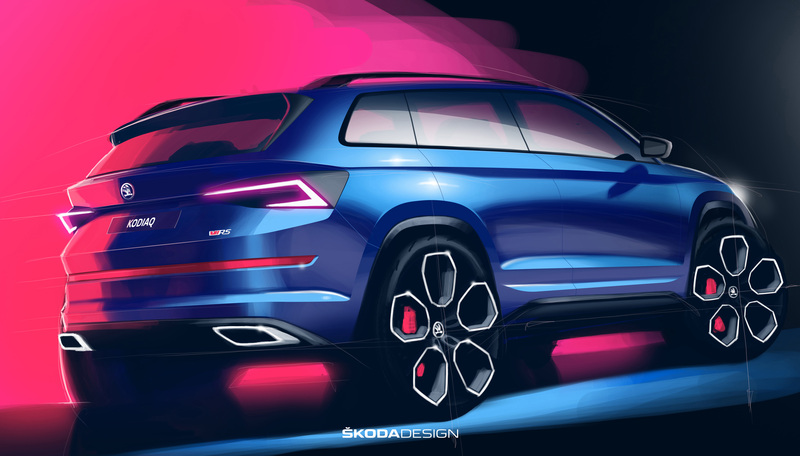 The ŠKODA KODIAQ RS demonstrates its dynamic potential at first glance. 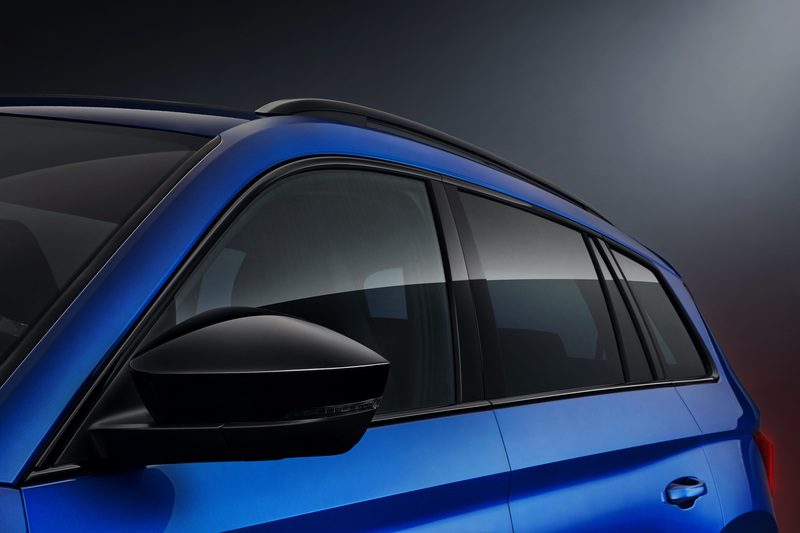 Specially designed front and rear bumpers, body applications in gloss black as well as new 20-inch Xtreme alloy wheels – as standard for the first time in a ŠKODA – mark the SUV out as a trendsetter of a sporty lifestyle. 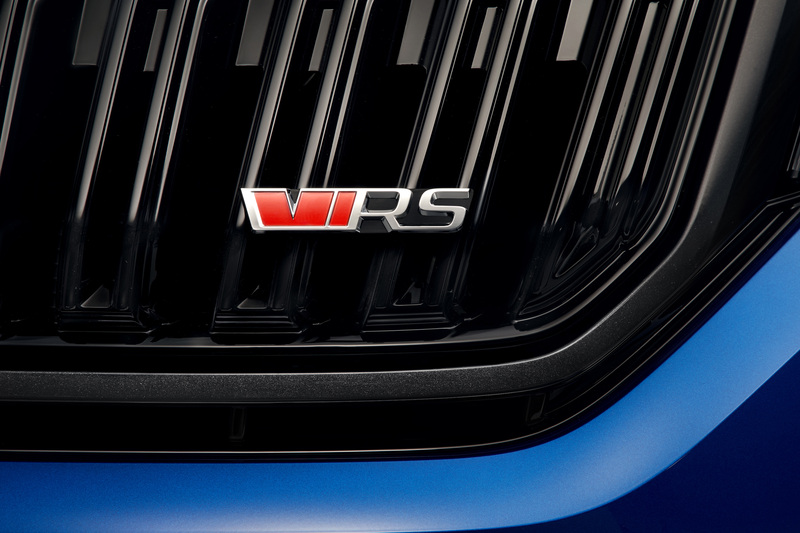 The new vRS logo identifies the KODIAQ as the youngest member of the ŠKODA RS family: the models specially designed for sportiness. 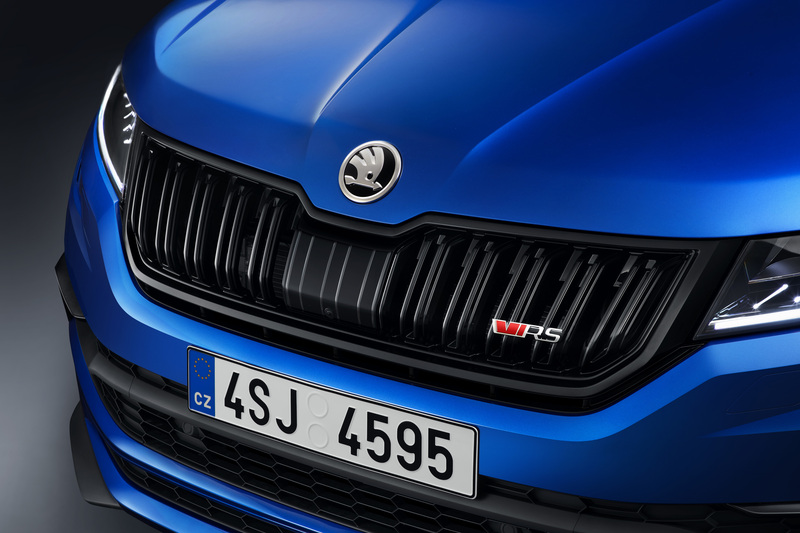 At ŠKODA, only the sportiest models bear the vRS logo. 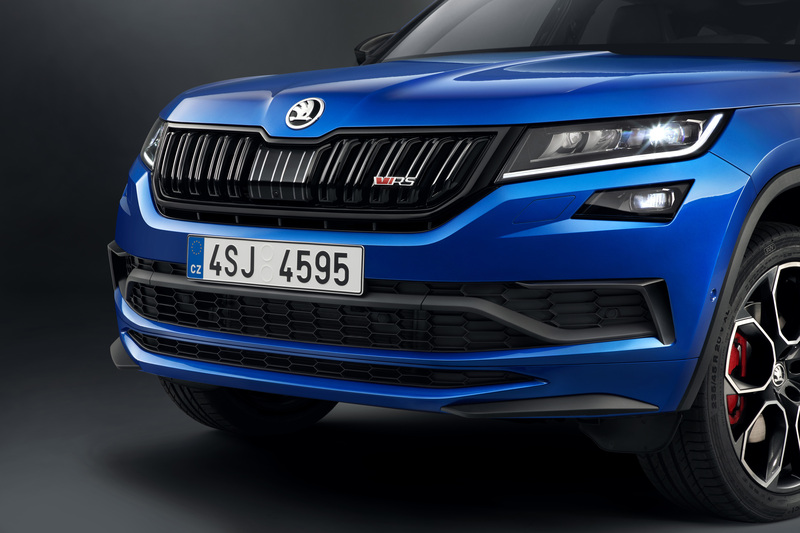 The initials appear on the radiator grille and rear of the ŠKODA KODIAQ RS for the first time in a new, modern design. 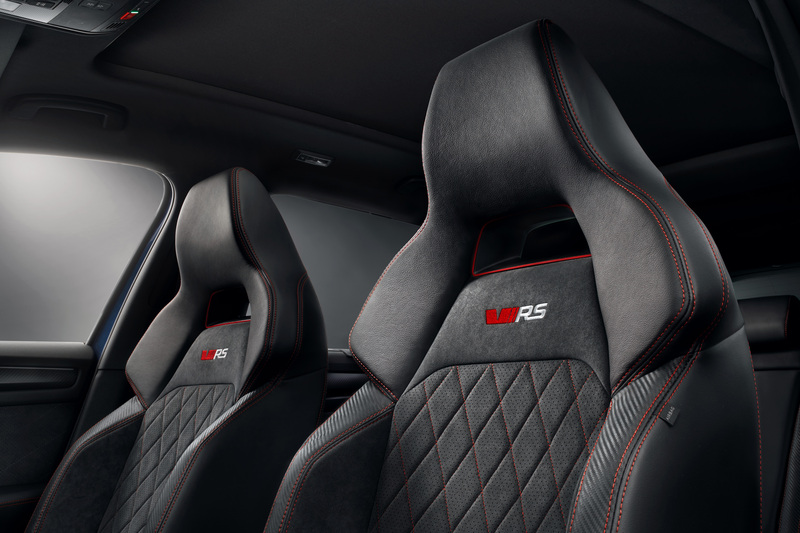 The ‘v’ stands for victory; in addition, the red colour symbolises the sportiness and power of the RS family. 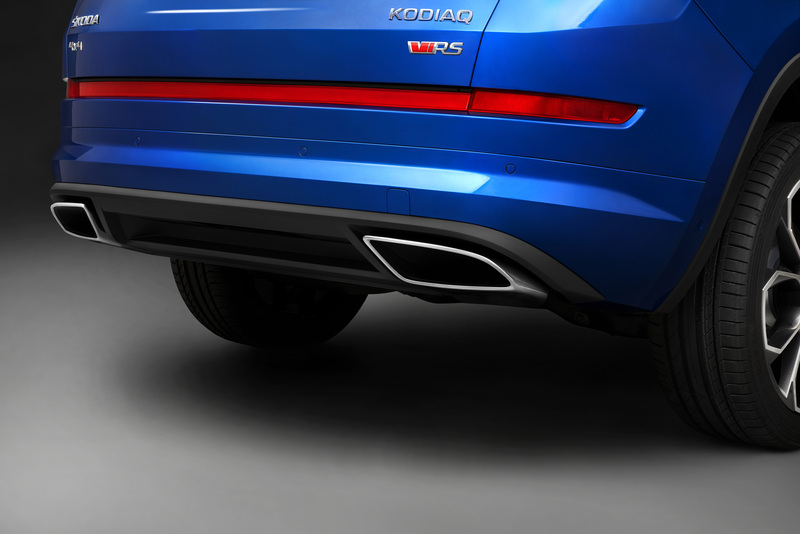 Specially designed front and rear bumpers emphasise the dynamic appearance of the ŠKODA KODIAQ RS. The rear bumper is equipped – as is typical for an RS model – with a reflector that extends across the entire width of the vehicle. The exhaust system’s tailpipes are visible below the bumper. Striking accents emphasise the sporty appearance of the most powerful ŠKODA KODIAQ: the radiator grille, window frames, wing mirrors and roof rails all come in gloss black, whilst the 20-inch Xtreme alloy wheels come in anthracite. 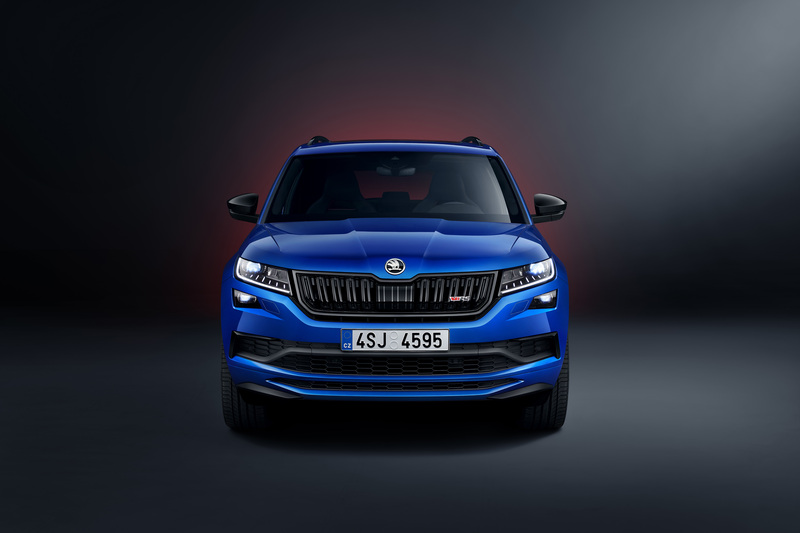 The KODIAQ RS is the first ŠKODA to offer wheels of this size as standard. 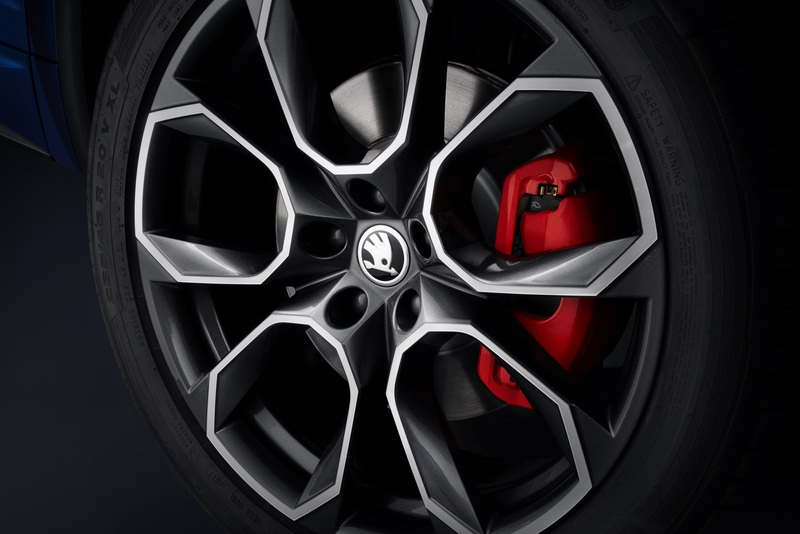 The wheels are paired with 17-inch brakes. 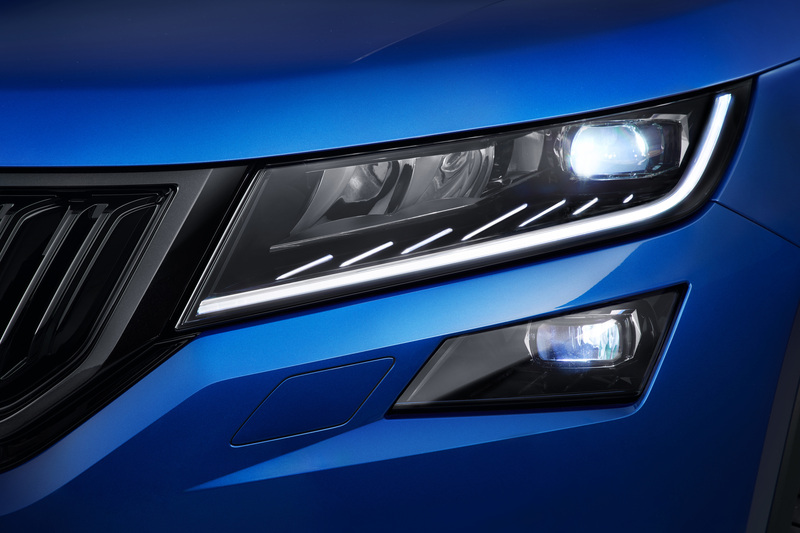 The front headlights featuring state-of-the-art LED technology, which come as standard, emphasise the car’s technical aspirations. The tail lights also use bright LEDs, which illuminate almost immediately. 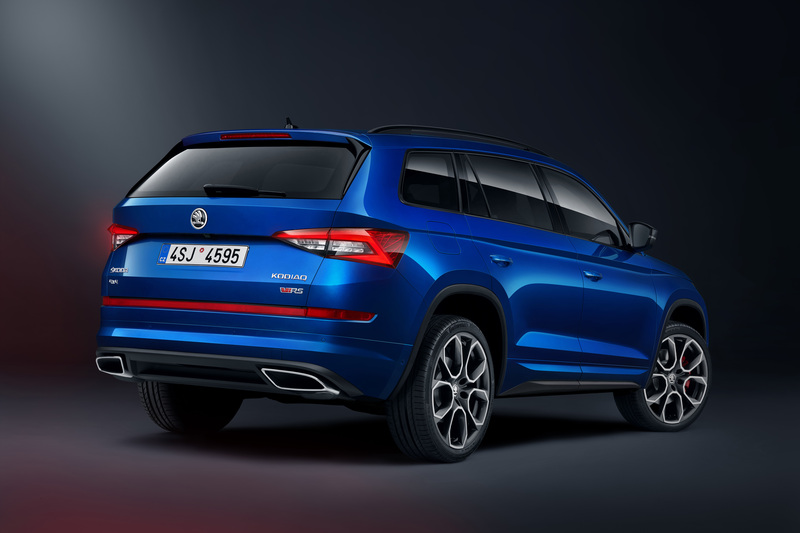 The ŠKODA KODIAQ RS combines a sporty style, comfortable amount of space and brand-typical practicality. 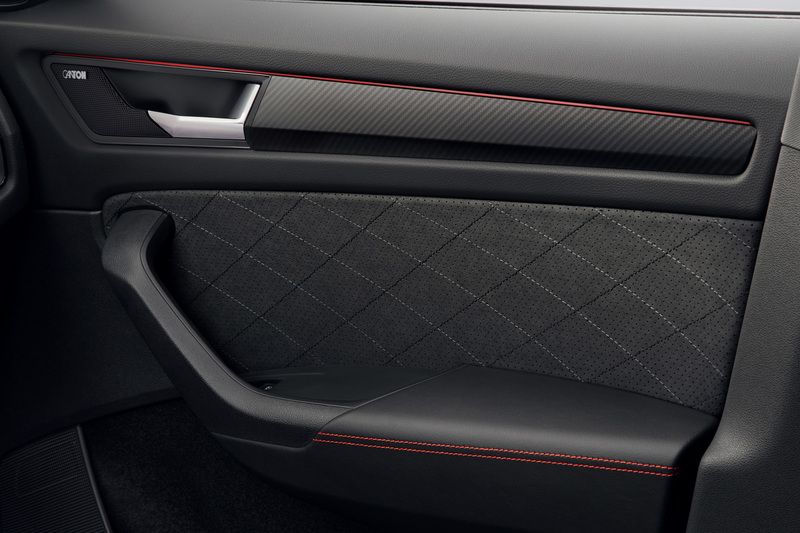 Alcantara® seat covers, door trims with contrasting stitching and the carbon fibre-effect instrument panel lend the spacious interior a sporty flair. 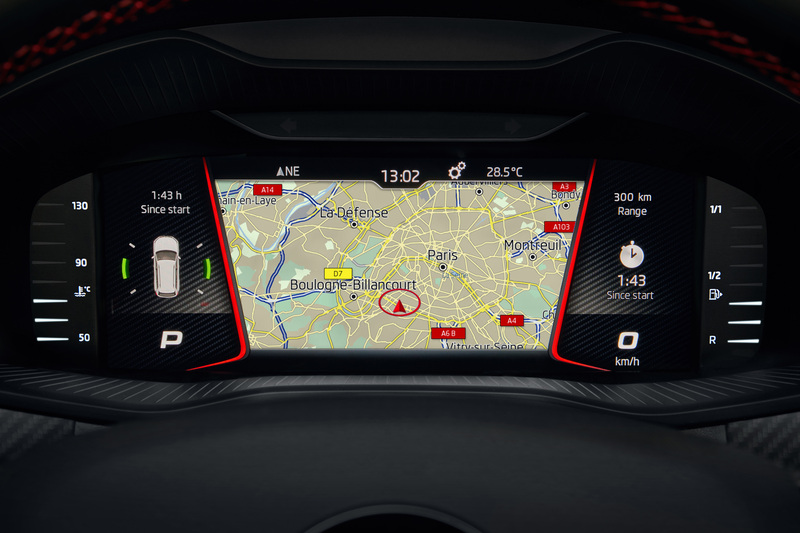 The Sport view and carbon background of the Virtual Cockpit perfectly complement the dynamic overall impression. 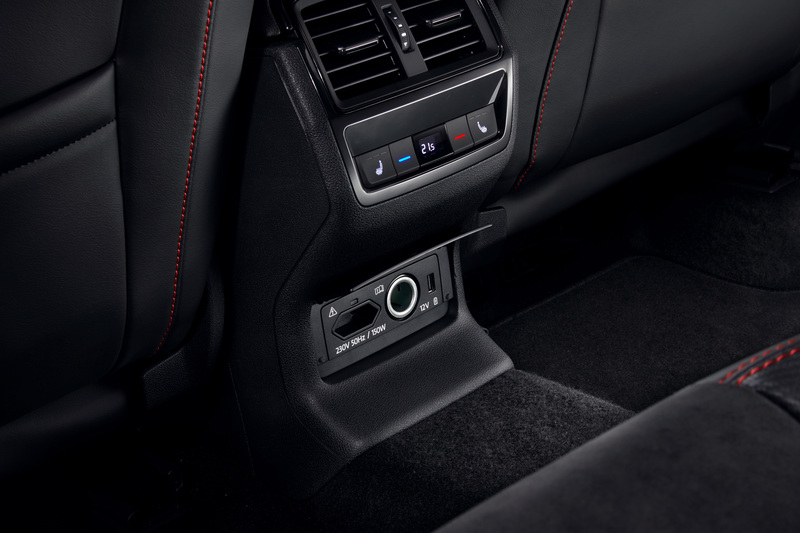 Exquisite materials, intricate contrasting stitching and red detailing also provide sporty highlights in the interior of the ŠKODA KODIAQ RS. 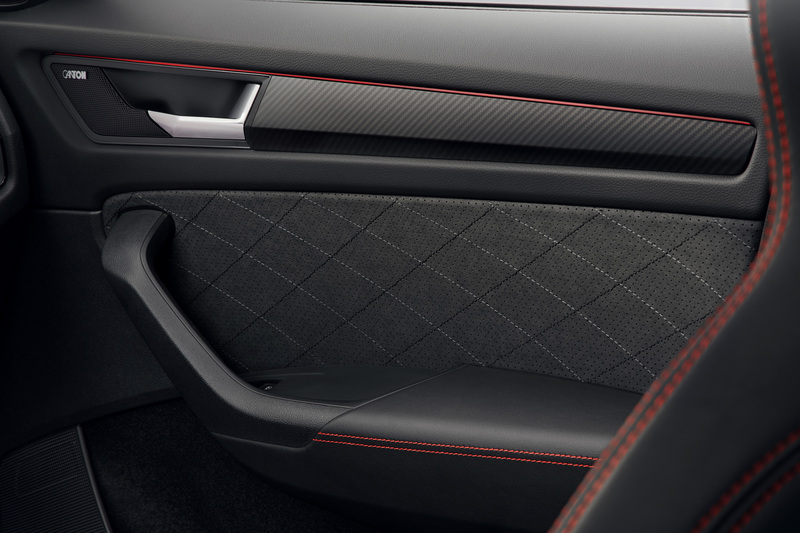 Perforated Alcantara® and carbon leather make the sports seats stand out. 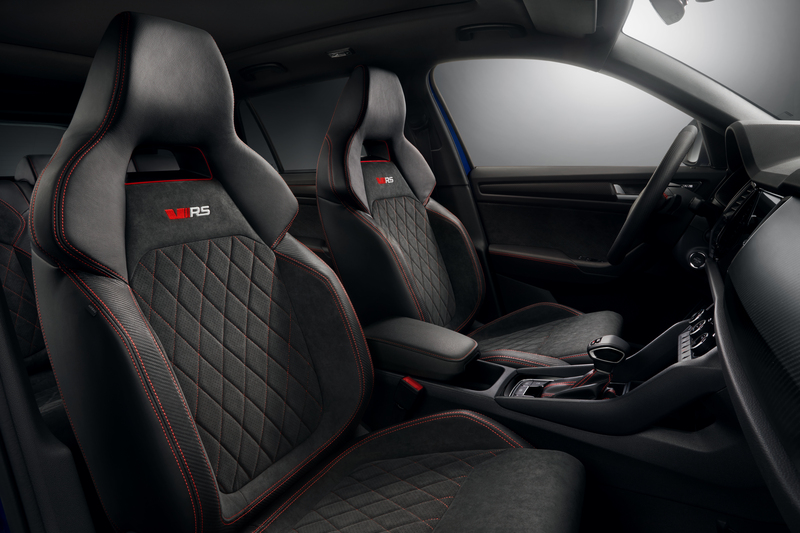 They offer contrasting, red, RS-specific stitching in a diamond-cross design and a matching red surface with the new vRS logo below the integrated headrests. The vRS logo also appears on the gearshift knob. Perforated Alcantara® is a material frequently used in motorsport due to its low weight and good grip. 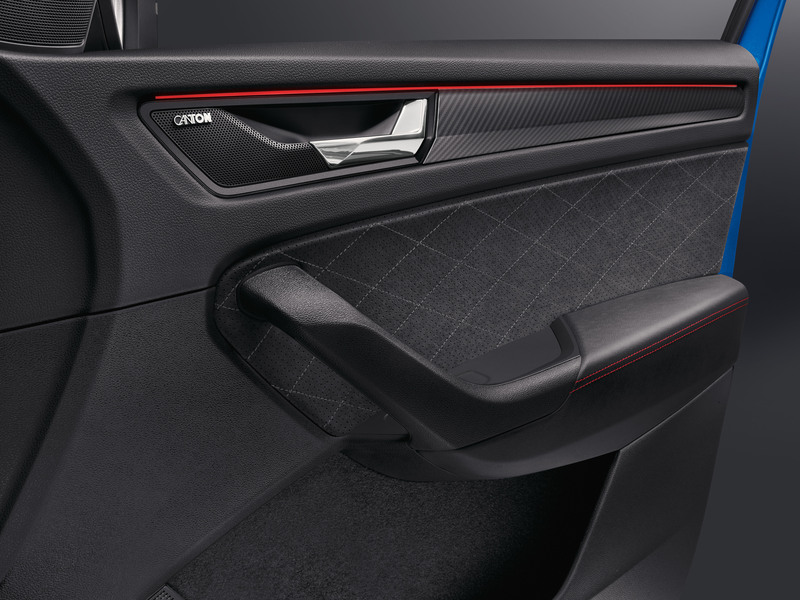 In the KODIAQ RS it is also used in the door trims, where it is finished with contrasting, black, diamond-cross stitching. 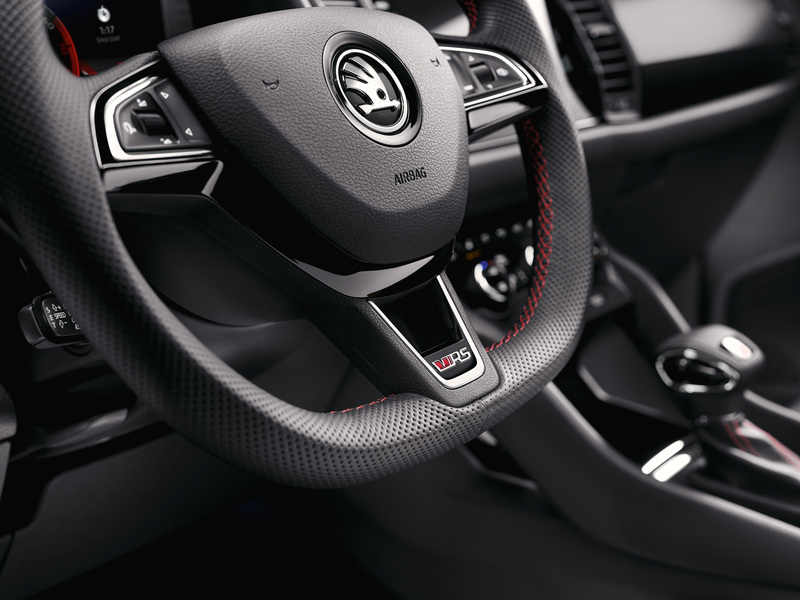 The multifunction sports steering wheel with a vRS logo features contrasting red stitching, as do the armrests in the doors. The instrument panel is finished in a carbon decor. 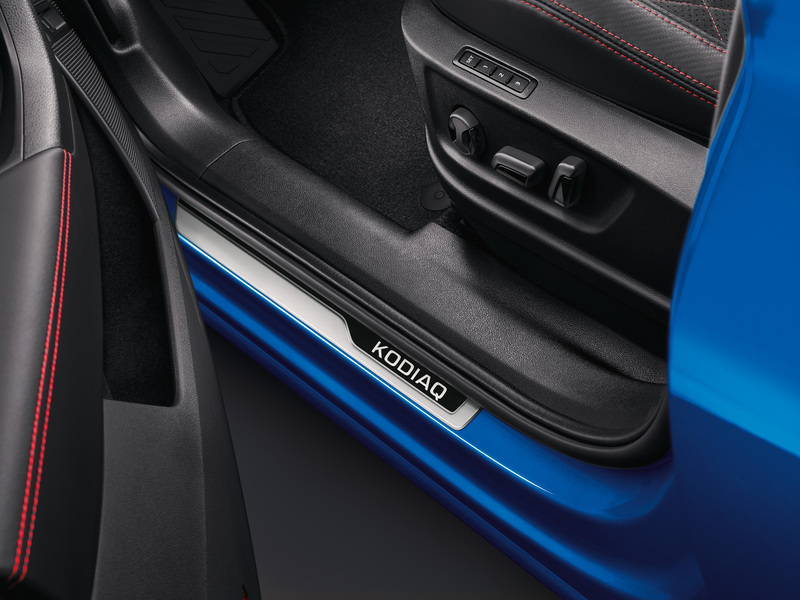 Standard equipment includes door sills featuring the KODIAQ logo and the LED package with ambient lighting. A black roof lining and pedal covers made from stainless steel complete the sporty appearance. 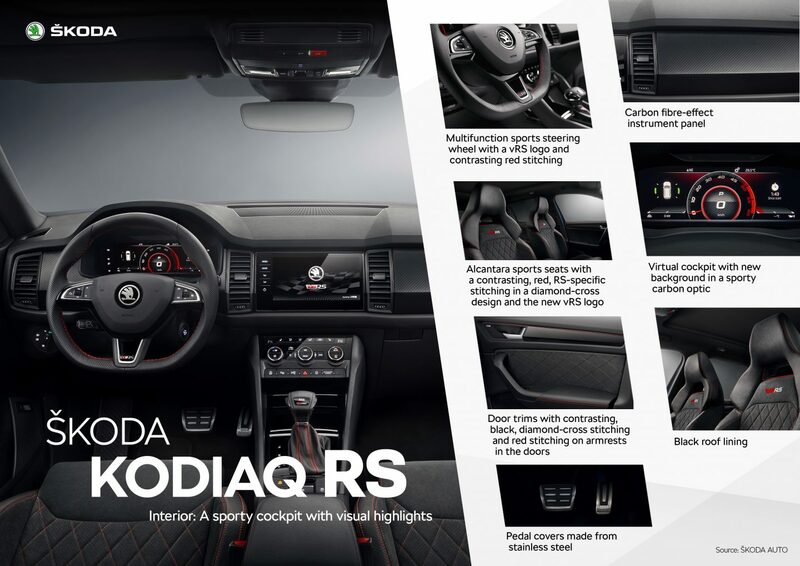 The ŠKODA KODIAQ RS comes with a Virtual Cockpit as standard and is available in a carbon optic. 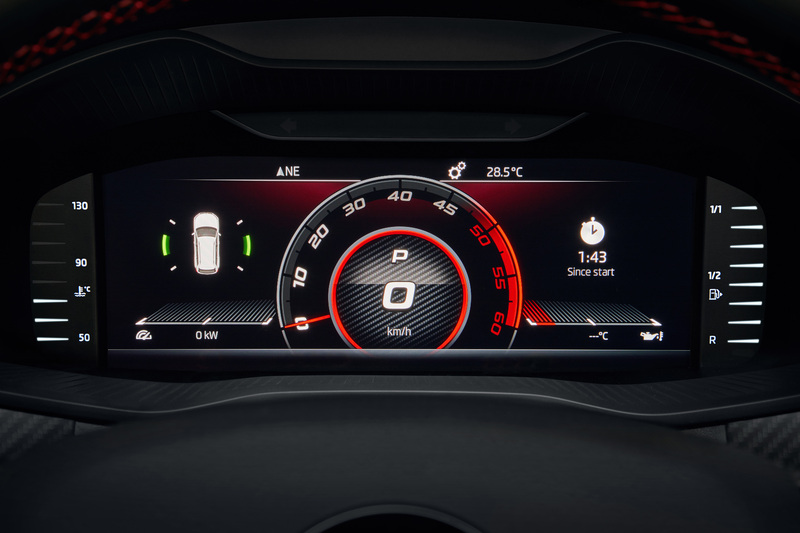 It also offers a fifth display mode in the ŠKODA KODIAQ RS. 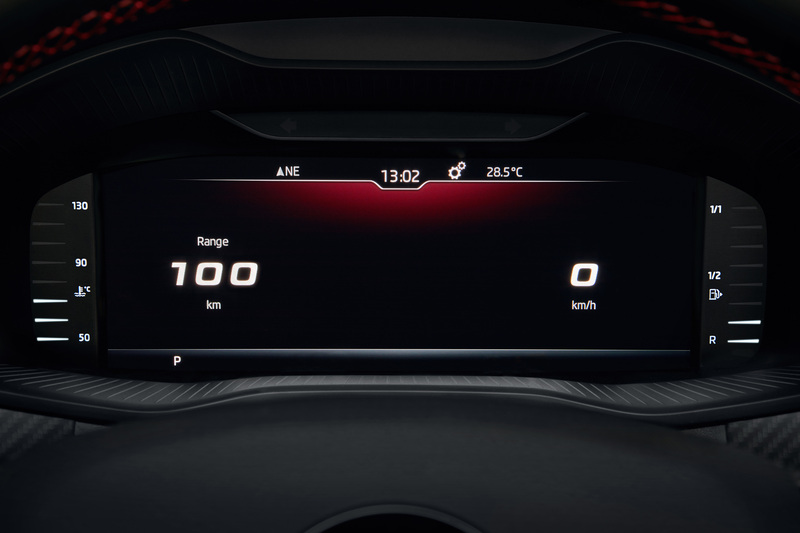 This features the rev counter and the current speed in the centre, meaning these parameters can also easily be read when the car is driven very dynamically. Other information, such as the radio station or navigational instructions, is displayed smaller. 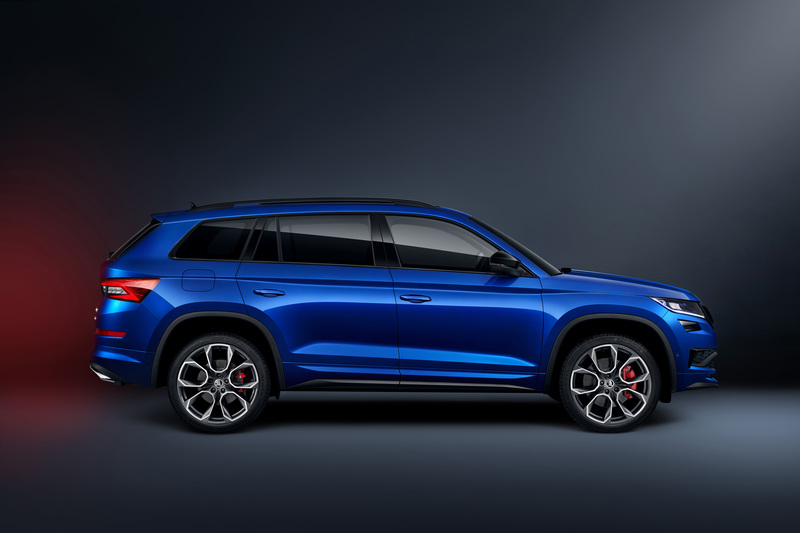 The ŠKODA KODIAQ RS also combines sportiness and comfort: an electrically adjustable driver’s seat with memory function and tinted windows (Sunset) come as standard. An optional personalisable key saves, for example, the seat position and driving profile, and automatically applies these settings when the car is opened. Even as a sportster, the ŠKODA KODIAQ RS remains a true KODIAQ with space for five or seven people. The five-seater offers a boot capacity of 600 l, whilst the seven-seater’s boot can hold 231 l with all of its seats occupied. 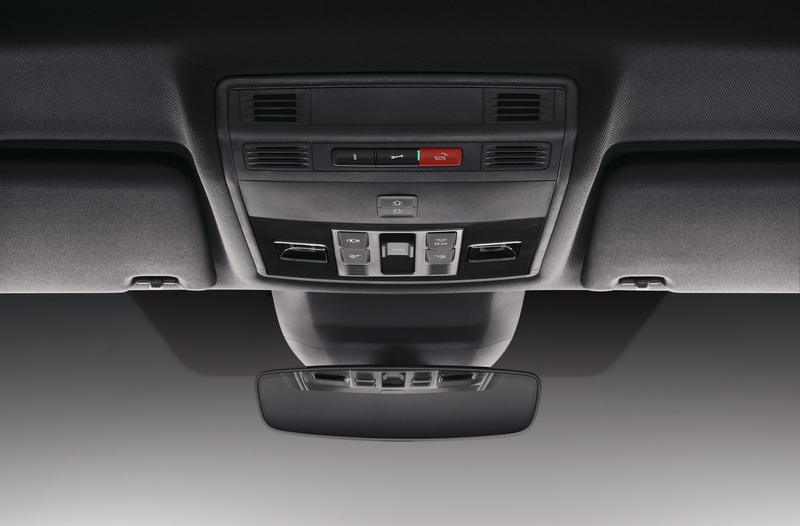 The Bolero infotainment system, which comes as standard, provides excellent sound; the optional Amundsen and Columbus systems allow ŠKODA Connect mobile online services to be accessed via the Internet. 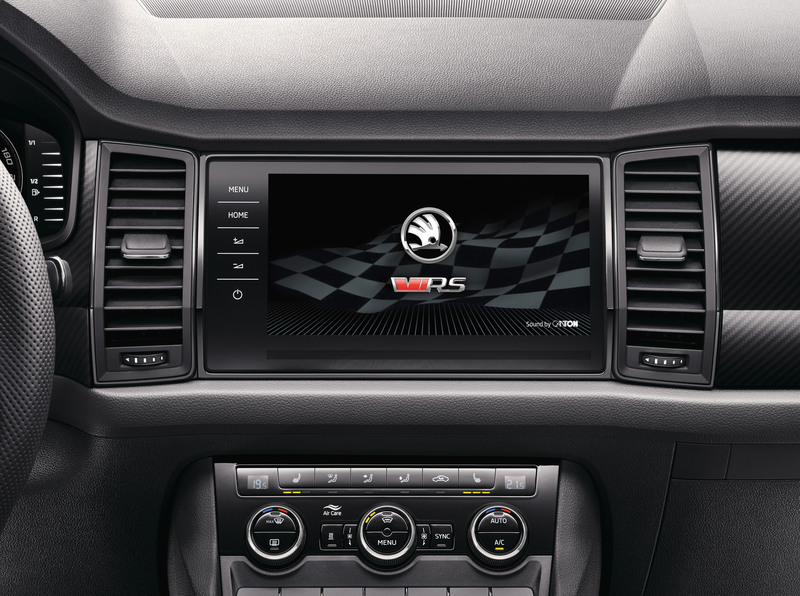 Using digital content is particularly easy with the Amundsen and Columbus infotainment systems in combination with ŠKODA Media Command 2.0. 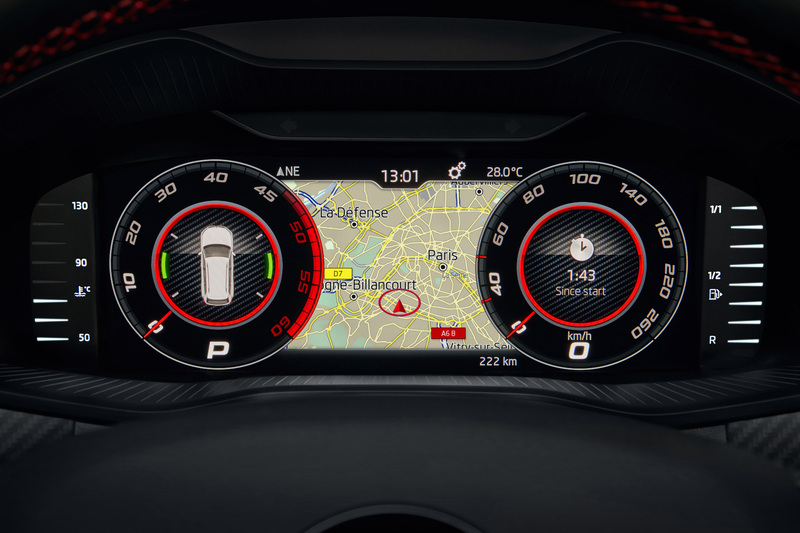 It is operated via the free ŠKODA app which allows the infotainment system’s functions to be controlled on up to two connected tablets. 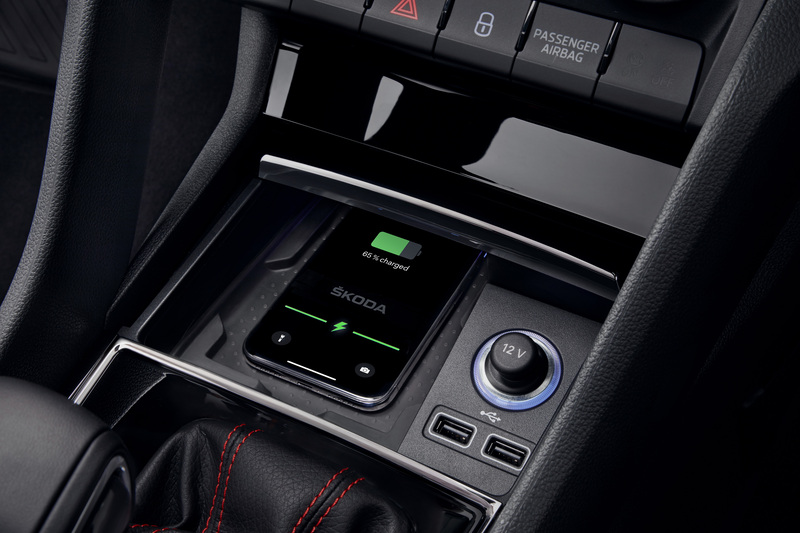 As an option, the ŠKODA KODIAQ RS offers Phonebox with inductive charging for mobile phones and two USB ports in the front. There is a USB port and 230-V socket on the back of the Jumbo Box between the front seats. 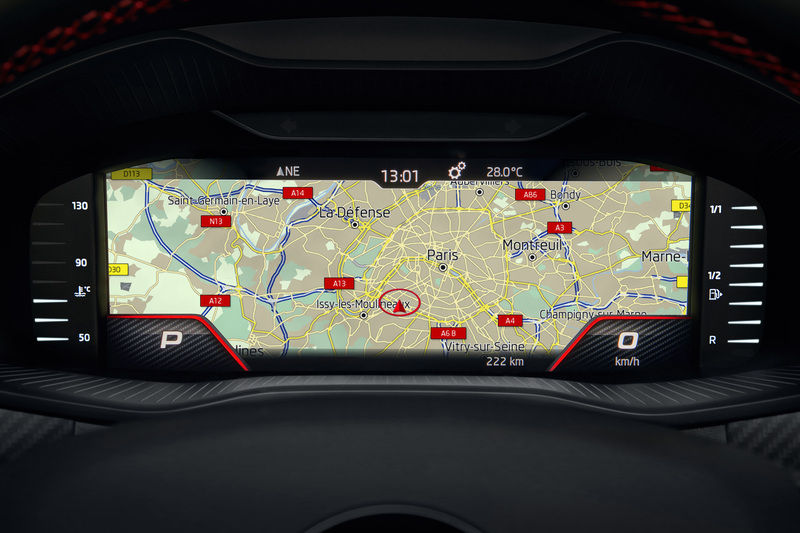 The In-Car-Communication system makes it easier to chat to passengers in the second and third rows of seats via the infotainment system. The ŠKODA KODIAQ RS also offers many ŠKODA-typical Simply Clever features. Standard equipment includes a removable and retractable load cover, and various nets for stowing and securing luggage. Classics such as the ice scraper in the fuel filler flap (for selected countries) or the umbrella compartment in both of the front doors (including umbrellas) are standard, as are the storage compartments for high-vis vests in all doors and a holder for multimedia devices. The driver’s side comes with a ticket holder in the A-pillar and a storage box with a slot for car park tickets, coins or SD cards. 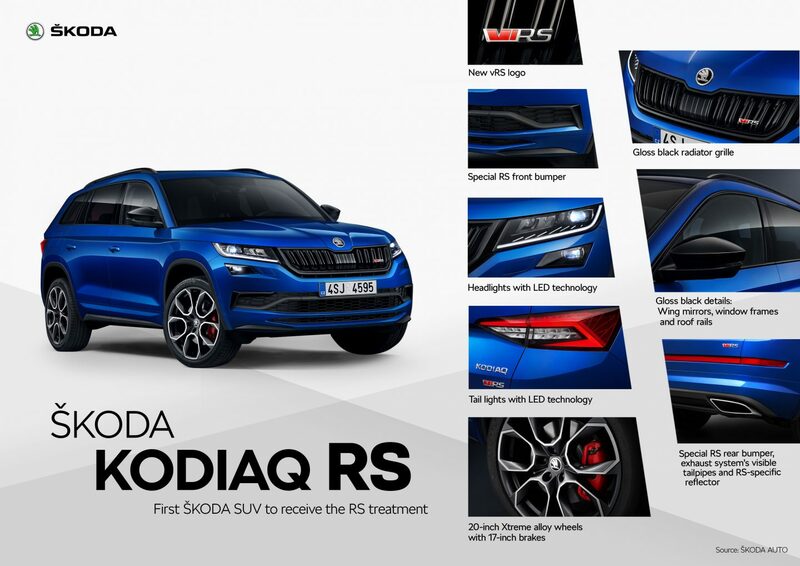 The ŠKODA KODIAQ RS is the first SUV to enter the ranks of the RS models which are specially designed for sportiness. The brand is thus transferring its now 117-year motorsport and rally history into an entirely new vehicle segment. 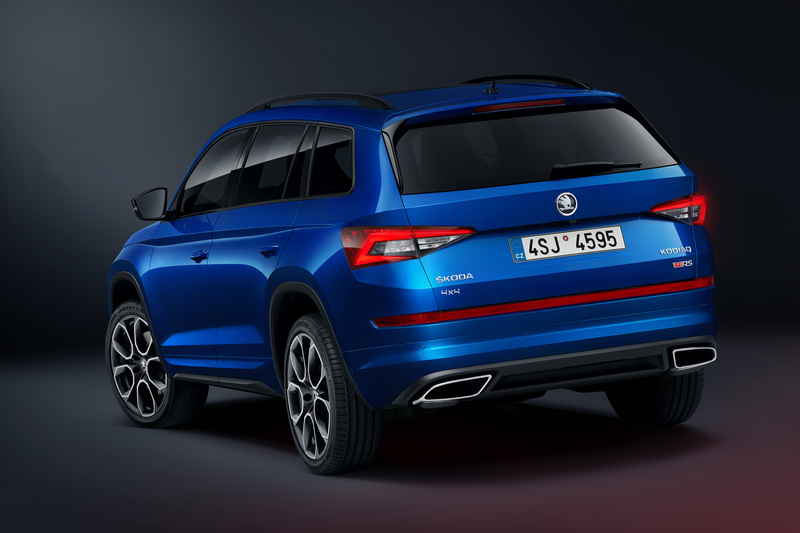 Having set the lap record for seven-seater SUVs on the Nürburgring’s Nordschleife, the ŠKODA KODIAQ RS has already proven in impressive style that it has the right to bear the RS initials. The initials RS stand for Rally Sport and were first used on the two rally prototypes, the ŠKODA 180 RS and 200 RS, in 1974. In 1975, ŠKODA developed these into the two-door 130 RS sports coupé, which became a success story based on the ŠKODA 110 R. In 1977, the ‘Porsche of the East’ finished first and second of its classification at the legendary Rallye Monte Carlo and also won the Acropolis Rally. The 130 RS was just as successful on racing circuits and took the overall win in the European Touring Car Championship in 1981. In 2000, the ŠKODA OCTAVIA RS was the first production model to bear the RS initials, marking it as the sportiest variant in the model range and thus ushering in a new era. At the same time, the ŠKODA OCTAVIA WRC entered the World Rally Championship. A ŠKODA FABIA RS with a 96-kW (130-PS) diesel engine was launched in 2003, and in 2010 an RS variant for the second-generation FABIA featuring a 132-kW (180-PS) engine with combined turbocharger and compressor entered the market. The ŠKODA FABIA RS provided the platform for the successful rally variants of the ŠKODA FABIA. Since 2015, the latest version of the superfast rally car – the ŠKODA FABIA R5 – has brought home more than 524 victories, making it the most successful car in ŠKODA’s motorsport history. ŠKODA won the manufacturer’s title every year from 2015-2017 and ŠKODA works drivers became world champions at the 2016 and 2017 FIA WRC 2. This year, ŠKODA crews have so far won eight out of ten events in the WRC 2 classification. ŠKODA Motorsport has therefore won the WRC 2 team championship for the fourth time in a row (awaiting official confirmation by the FIA). The ŠKODA works drivers Jan Kopecký and Pavel Dresler (CZ/CZ) have taken a giant step towards the WRC 2 Championship title with their victory at the Rally Turkey, the tenth of thirteen World Rally Championship events. Mathematically, only their teammates Pontus Tidemand and Jonas Andersson (SWE/SWE) still have a chance of winning the title. Either way, the next WRC 2 champion will be a ŠKODA works driver.